Convicts are a fascinating part of Australia's history, but has their role been over-dramatised and distorted? This book brings to life the day to day working lives of convicts in private assignment. In particular, life and work on Belgenny Farm at Camden Park near Sydney, and the Tocal estate in the lower Hunter Valley where large numbers of convicts were assigned. 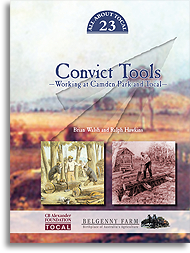 Published in 2013 Convict tools - working at Camden Park and Tocal is 92 pages full colour with many illustrations. Book size is 250mm by 185mm.